We need to offer two votes of congratulations today. The first goes to our new boy Head Chorister, Taylor who was installed last week after his predecessor's voice took its natural course rather earlier in the year than anticipated! We've heard Taylor's voice as soloist on many occasions and look forward to hearing it much more as we wish him all the very best in his tenure. Of course, we are very sad to see the former Head Chorister, Bailey leave but wish him all the best for the future and look forward to giving him a proper send-off in due course. Secondly, we're delighted to congratulate Matthew Owens on his installation today as a Prebendary of Wells Cathedral. A first for an Organist at Wells Cathedral, as far as we know! 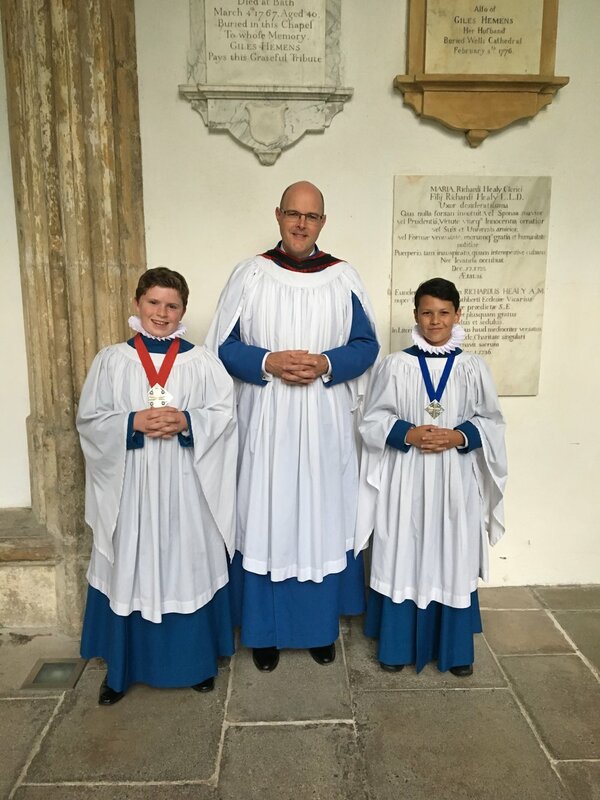 Matthew and Taylor are pictured here with Deputy Head Chorister, Xavier. Newer PostTwo More Excellent Reviews!